I'm running Haiku R1A2 OS on a Dell E520 which has an Intel 82801H (ICH8) soundcard. Unfortunately the hda driver for Haiku, which should be appropriate for this card, is buggy so it didn't work for me. However, I was able to get a Haiku version of OSS to work perfectly by disabling both the pre-installed hda and auich sound drivers. Interesting that although OSSTEST worked fine when I had disabled the hda driver (All tests completed OK -- although only got sound from one of 16 audio engines), the media player gave no sound until I had additionally disabled the auich driver. About a week ago, however, I had to do a clean re-install of Haiku and subsequently went about configuring the OS for my normal use. Once again, I installed OSS for Haiku (from the above link), disabled the hda and auich drivers but this time no sound. Now OSSTEST works just as before (All tests completed OK -- although hear sound only from one of 16 audio engines). Nevertheless, no amount of enabling or disabling the other sound drivers has allowed my media player to produce sound. Perhaps the problem lies in the mixer. However, in Haiku there is no GUI for the mixer and I have not succeeded in experimenting as suggested in the troubleshooting section of the OSS wiki. Can anybody help me get sound working here? B) IIRC, there's an haiku module which needs to be enabled (a translator driver of sorts) to translate between OSS and Haiku's media manager. Is it enabled? Oh, and hearing sound from only one engine isn't unusual - I recall the default build has vmix disabled. I'm not aware of the "translator driver of sorts" that you mention but I will enquire in Haiku circles. However, in the meantime, I have made some progress. OSSPLAY works fine for me as long as I direct it away from /dev/dsp, which doesn't exist, to /dev/oss/oss_hdaudio0/pcm0 (which is the only one of the 16 audio engines that worked in OSSTEST). The other necessity for OSSPLAY to work for me in Haiku is that I need to convert my .mp3 files to .wav for which Haiku has a nice app. Note that I had tried to symlink /dev/oss/oss_hdaudio0/pcm0 to /dev/dsp as suggested in the OSS Wiki Tips & Tricks section. However, Haiku would not allow symlinks to /dev/dsp for reasons that are not clear to me. Further, I can't get either VLC or Haiku's native media player to produce sound from my .mp3's although they do "play". Seems, therefore. that the problem lies within either Haiku or the media players and NOT with oss. mmu_man intentionally did not expose OSS API (or enabled vmix), but instead kept the Haiku media manager API as the near only way for programs to output sound. This is the translator plugin - make sure it's enabled. Btw, ossplay also supports ogg files if compiled in the right way (and libvorbisfile is present), not sure this is the case with this compile. Thanks again for your reply and the link. Well, there already is a file called opensound.media_addon (of 127 kB) in the directory /boot/system/add-ons/media which I presume (but don't know for sure) that what you are proposing is already enabled. Yet, neither VLC 0.8.6 nor the native Media Player produce sound from .mp3 files in my system. Is it there? Maybe it got muted? Can you paste output of 'ossmix'? Well, this is quite remarkable but VLC 0.8.6 has now started playing .mp3 files perfectly. Other than opening and closing Media Preferences a few times, I really do not believe that I did anything at all, either purposely, nor, I'm pretty sure, inadvertently. 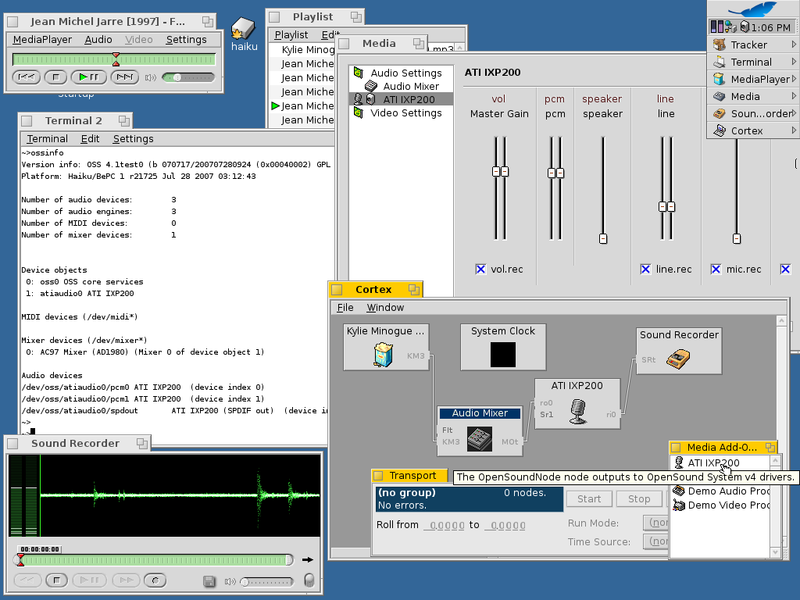 In any event, yes, there is an Audio Mixer present in the Media preferences and neither the Master Output nor the player output are muted.